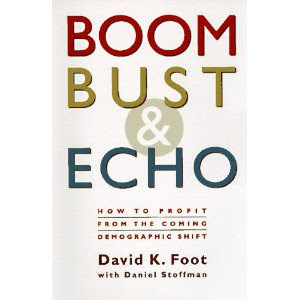 "Boom, Bust & Echo" by Daniel K Foot was a staple reference during my university courses whenever the subject of demographics arose. As a consequence, when I found the book at a used bookstore when re-visiting my Alma mater, I had to pick it up. Some will say there is very little value in reading a book that is 15 years old on business, because changes in the economy generally occur very quickly, especially in industries like technology. However, I find that just like history, you can learn a lot from the past, especially with the benefit of hindsight. Since boomers have aged 15 years since this book was published, you have to remember that the spending of the boomers will change correspondingly from what is mentioned in this book. The key point I found was that boomers don't want to feel old, more than any other generation preceding them. To deliver products and services that make them feel young is going to be an important trend. For example, most will not want to be put in homes, so post 2010 home healthcare should be a growing industry. Right now, most boomers will begin retiring and will have demand for products and services reflecting their age (mainly services since boomers are wealthy and already have almost all they need). Leisure activities shift from things like Tennis (typically a younger person sport) to bird watching and gardening. My generation is the Echo generation, which begins in 1980. 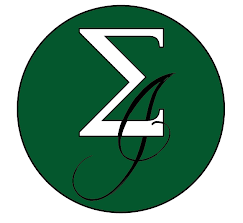 Since I'm at the start of this cohort, this is generally better for wealth accumulation. Those born later in the cohort end up having to buy homes already bid up from the start of the Echo generation. This occurred with the boomers... if you got in in the early 80's you were able to accumulate a lot of wealth in your home as the rest of the boomers drove up demand. Limited supply saw these homes appreciate in value until the cohort peaked and boomers no longer needed houses (they already had them). Real estate prices decrease at the apex of the curve. The Echo generation (currently entering their 30's) will have needs for key industries such as baby products (average age that couples have children is 28), fertility and later... wealth management as mortgages and debt get paid off (usually after age 40). Therefore, the echo generation will start saving in another ten years or so. This should mean that companies in the wealth management industry will do well, and it will probably make sense to look hard at this industry when purchasing stock. Some interesting things talked about, include how demographics (supply and demand) will effect subsequent generations regarding wages, unemployment and technological change. Eventually, as the boomers get to their retirement ages... there will also be an increased demand for positions in non-for-profits as wealthy boomers look to make a difference in society. Many will move to rural areas to wind down from years of living in suburbia or the big city. Those who stay in the city will demand condos, for simplicity. This book also talked about some great ideas for changing government systems, which I can't believe have not been instated (I CAN believe it, but it makes me upset that common sense techniques are not being utilized). One example is having two shifts of classes (say 8am-1pm, 1pm-6pm) when supply of students is greater than demand. Why spend so much on fixed costs by building a school if no one is going to be in it for half of the day. Why not do the same with the school year instead of starting everyone in September? Makes sense to utilize facilities better and reduce the cost of our education system, one of the highest of developing nations. In the healthcare industry, why are we paying doctors based on prescriptions written and test done? This rewards those who file for unnecessary procedures. Why not assess the health of doctor's patients and those reward those doctors that have 'less sick' patients (a system called 'capitation')? To do this, you'd have to ensure that doctor's cannot choose patients, or they would only accept young patients (patients over 50 visit the doctor many more times than those younger) or those who don't smoke. In the end, if you do this with all doctor's... it will roughly balance out. The point the author makes is that, in Canada, while we have one of the best healthcare systems in the world... we pay 40% more than countries with similar services... so why wouldn't we change our system to cut costs if we could give the same levels of service? There is also a great piece on transit (using Toronto as an example) and how to best build a transit system (pay for distance like in Europe, and not on a one-fee per ride basis). The one-fee per ride system has people living in the downtown core paying for people on the outskirts of the city... which is unfair. If we eliminated this, then transit could pay for itself instead of it being heavily subsidized. There would be less urban sprawl as a result of this, as people would prefer to live downtown. Since the transit company would be making money, the subway could grow within the downtown core and pay for itself. This book is chalk full of great suggestions on how to invest, how to make current systems more efficient and how to best ensure that you make better decisions by taking into consideration demographics. I can see why this work is quoted so often in business courses, and I would recommend that anyone looking for information on the topics listed above, give this book a read. While demographics in North America in isolation are becoming less important from an investment point of view in today's globalized world, demographic tools can be applied to many countries to understand what is going on politically and economically in those countries as well. Unemployment and poverty are prime causes of poor health, so to reduce healthcare costs a city needs to tackle these issues. 1 in 3 households will have babies before marriage in Canada. Demographics also predict when traditional families (one spouse at home) will exist. I won an award and I'm passing it on to you!